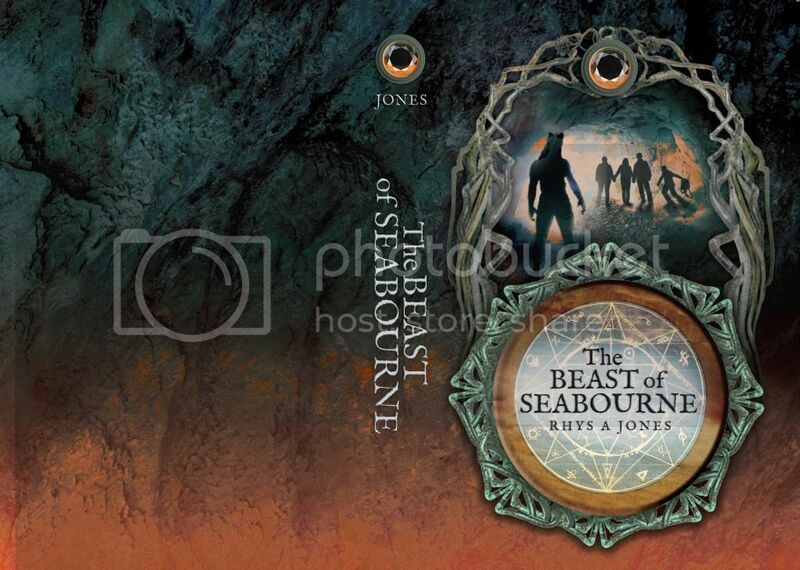 Welcome to The Cover Contessa's stop on The Beast of Seabourne blog tour! "Oz Chambers has a wonderful secret; the obsidian pebble, gifted to him by his dead father, is an artefact of astonishing power. The sort of power that makes the year eight science project a hands-down walkover thanks to the the pebble's genius avatar, Soph. But, there are sinister forces abroad who will do just about anything to get their hands on the pebble, and when fellow pupils start being attacked, Oz finds himself in very hot water. 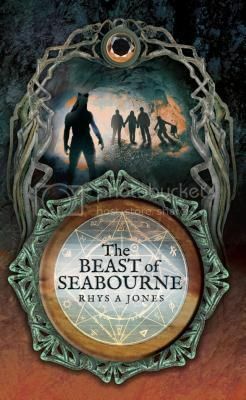 Soon Oz and his friends, Ruff and Ellie, are caught up in a centuries old mystery involving a missing ring, lava toothpaste and a murderous monster known as the Beast of Seabourne." Today Rhys is here to tell us a bit about his favorite mythical creatures! Say hello to the nuckalavee. First of all its roots are in the Orkney Islands, an archipelago on the North East tip of SCOTLAND. A location of such remoteness it was chosen by Mary Shelley as a retreat for Victor Frankenstein. A place where he could contemplate the horror of his work in a 'desolate and appalling' landscape. No surprises then when the immeasurably ancient Nuckalavee turns out to be a truly horrific beast that puts Frankenstein’s' monster in the shade. Spawned in the ocean, it habitually wanders onto land to raise hell. An invincible foe, controlled only by the benign and mythical Mither o’ the Sea. But it's aversion to fresh water means that you can save yourself by crossing a stream. Otherwise, terror and death are its offspring. And woe betide anyone who dares burn seaweed since that will enrage the beast to acts of monstrosity that will kill everything in its path. 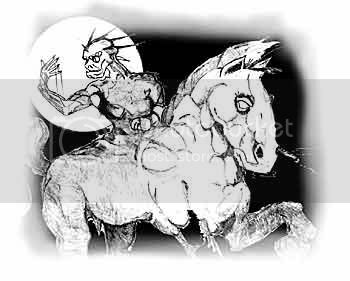 The Nuckelavee is considered so awful that it is bad luck to even say the word out loud. And its appearance lives up to its press. 'A bind and eyeless creature in the vague shape of a horse with its rider melded into its back and bearing a massive head and one glowing red eye. The human arms are far too long, hanging down below the horse’s barrel. And to add to its striking appearance, it is completely without skin. Muscle and tendon are its coat covered by black blood pulsing through yellow veins. It had me at 'saying its name out loud'. I liked it so much that I had to include it in one of my stories set in Edinburgh, called the Curse of Borage-Doone. Those of you who have visited Scotland's capital city will know that it is a place full of hidden closes and long narrow passages. Just the sort of setting on a winter's night where the steam pluming out of the head of some horse-like apparition is glimpsed from around the next poorly lit corner. That's what my protagonist encounters. And, he's only 10. EEEK! Thanks so much for being here today, Rhys. As always, great to have you! You want to know? Really? Okay, okay, here’s the bio. Rhys A Jones was born in 1955 and grew up in a mining village in South Wales with his nose in a book and his head in the clouds. He managed to subdue his imagination long enough to carve out a career in medicine, writing whenever the chance arose. Rhys has three grownup children who have emerged remarkably unscathed into adulthood. When not writing, he practices medicine and lives in darkest West Wales with his understanding (very) wife and two dogs. Oh, and the Rhys is pronounced Reece–as in the actor Rhys Ifans of Mr Lovegood (Harry Potter) and The Lizard (The Amazing Spiderman) fame. Or perhaps it’s easier if you just think of Reece Witheespoon, though she is a lady. Thanks a million once again for hosting me.